After nearly 20 years of ‘reformist’ measures, the police in Mexico continues to be an ineffective, unreliable, and ‘far from citizen’ institution. The efforts made so far have faded amongst political interests and agendas; multidimensional frameworks out-dated at both conceptual and interagency levels; short-sighted competition for resources; evaluation and performance monitors that are handicapped by bureaucratic inaction; and weak transparency and accountability that perpetuate the opacity in which the police operate. In this context, the agenda of external police oversight is still at a rudimentary stage. However, there are several initiatives that have managed to push the issue to the frontier of new knowledge and promising practices. This paper outlines the experiences and challenges of—as well as the lessons learned by—the Institute for Security and Democracy (Insyde) A.C., one of the most recognised think tanks in Mexico. In political science terminology, ‘gatopardism’ or ‘lampedusian’ are often used to refer to seemingly revolutionary policies and institutional changes that in practice only superficially alter power structures whilst retaining the primary elements that prompted transformation in the first place. The police in Mexico, after nearly 20 years of ‘reformist’ measures, remains—in its different levels, structures, and mandates—an ineffective institution.1 Monitoring mechanisms exist but, in reality, are opaque and highly discretionary in their application. In many instances, there is evidence of corruption or collaboration with organised crime. Most alarmingly, the police display a disrespect regarding human rights and an ambivalence towards citizens. The recognition of this association between police institutions and organised crime was one of the chief political determinants that led to the inclusion of the Mexican Armed Forces (FAM) in public security tasks between 2006 and 2012. This policy decision was based upon the argument that a frontal attack was necessary to dismantle organised criminal networks as well as ‘clean’ and ‘relaunch’ compromised police forces. However, the results of this six year campaign resemble a humanitarian crisis: an estimated 50,000 to 60,000 deaths, a homicide rate that has tripled, soaring rates of kidnapping and extortion in addition to an estimated 26,000 missing persons.2 According to the National Human Rights Commission (CNDH),3 human rights violations by armed service members have increased six to seven times between 2007 and 2012 (CNDH 2007—2013). Overall, efforts to reform the police and justice systems during this period have been hindered by political interests and agendas; the absence of multidimensional frameworks aligned from a conceptual viewpoint and committed to interagency cooperation; the struggle between municipal, state, and federal institutions for resources; performance and evaluation mechanisms disrupted by bureaucratic inaction; and a lack of transparency and accountability. In 1995, the General Law that Establishes the Basis for the Coordination of the National System of Public Security was enacted. This was established to articulate and coordinate public security institutions across the three levels of government (municipal, state, and federal). In 1998, the Fund for Public Security Contributions (SPA) was approved. The SPA applied to federal entities and focused on recruitment, training, evaluation, equipping, and strengthening of the telecommunications network, emergency call management system as well as investigative and prosecutorial agencies. In that same year the Federal Preventive Police (PFP) was formed. It was conceived as a rapid response unit, dedicated to maintaining internal order and social peace. However, FAM personnel comprised just over half of it (Moloeznik 2012). During the presidency of Vicente Fox Quezada (2000—2006), the PFP was moved from the Interior Ministry and placed under the authority of the newly created Federal Ministry of Public Security (SSPF). At this time, the Federal Investigation Agency (AFI) was also established and—together with the Attorney General of Mexico (PGR)—replaced the Federal Judicial Police, which had been compromised by its connections to organised crime. In August 2008, the National Agreement on Safety, Justice, and Legality (ANSJL) was signed. This accord was comprised of 74 commitments –many of which fell on state governments– that regulated the evaluation and monitoring of police, the consolidation of information systems into fully structured databases, the creation of anti-kidnapping units, etc. Nonetheless, progress in these areas has been achieved at an uneven level and rate throughout the country. In June 2009, President Felipe Calderón (2006—2012) issued a law that transformed the PFP into the Federal Police (PF), an organisation imbued with both preventative and investigative powers. The PF was envisaged as an aid to state, municipal, and federal police in the fight against organised crime. This decision was framed amid an alarming increase in violence, kidnappings, and corruption in law enforcement offices and other relevant agencies. Whilst the government conceived of the PF as a modern, professional, and well-trained force, the demand for results encouraged a permissive environment of questionable action and abuse. In 2006, the CNDH recorded 146 human rights violation complaints levelled against the PF; by 2012, the number of complaints had quintupled to 802 (CNDH 2007—2013). In 2009, the National System of Public Security (SNSP) replaced the 1995 General Law that Establishes the Basis for the Coordination of the National System of Public Security. This was intended to better coordinate public security responsibilities amongst municipal, state, and federal authorities. These efforts were managed by the National Council of Public Security (CNSP), which included the president; Secretaries of the Interior, National Defence, Navy, Public Security (now the National Security Commission); the PGR; state governors; Head of Government of the Federal District; Executive Secretary of the SNSP; and five citizens councillors (with voice but without vote). At the federal level, the proposed Uniform Law of Police Command—sent to the Congress of the Union in October 2010 by President Calderón—warrants attention. This legislation assumed that municipal police forces (whose agents represent more than one third of the total active police force in the country) are the weakest link in the public security system.4 Therefore, municipal agencies would be absorbed by state police forces and placed under the command of state governors. Rather than a new policing model, the proposed law reorganised federal and state command structures, with power and discretion being granted to governors. This restructuring was not a minor decision, as it meant removing the police force closest to citizens. Although the initiative was unsuccessful, improvements have continued in a more discreet manner. Recent analysis shows that ‘there has been progress in 31 states of the country and today 73 per cent of Mexicans live in municipalities that have Single Command cooperation agreements’ (Presidencia 2014). During this same period, the Comprehensive Police Development System (SIDEPOL) was created with four focus points: develop a professionalised program model; establish a civil service career program; define disciplinary mechanisms; and strengthen police and public security institutions. Platform Mexico was also launched in an attempt to construct an unprecedented and unified national database in order to provide access to criminal records and expedite investigations. These initiatives are far from achieving their intended outcomes. Under the current administration of President Enrique Peña Nieto (2012—2018), the Interior Ministry (Home Office) has assumed the responsibilities of the SSPF. It implements prevention policy through the National Commission for Security as well as the Undersecretary for Prevention and Citizen Participation in accordance with the SNSP. Additionally, the Uniform Criminal Procedure Code has been promulgated in order to accelerate justice reform and harmonise various legal codes in effect at the state level. Furthermore, the launch of a new police force, the National Gendarmerie, has been announced. Under the purview of the Federal Police, this agency—initially comprised of 5,000 agents—will provide response, special operations, social control, and rural operations services in addition to replacing local police (Diario El Universal 2014). This is a brief summary of major ‘reformist’ changes in recent years that have succeeded in improving structural alignment and coordination but failed to substantially reduce crime or instil greater public confidence in police institutions.5 They have required significant institutional, human, financial, and technical investments with little discernible impact (Mexico Evalúa 2011; Insyde 2014). In reality, each of these institutions operates under poorly articulated frameworks, work schemes, and strategies as well as varying levels of capability and resources. As Ernesto López Portillo has observed: ‘The country still has not defined a modern, professional and democratic policing model to guide decisions at the three levels of government’ (López Portillo 2014). The operating conditions of municipal police forces—which, except in rare cases, function with considerable weakness—evidences the problematic nature of centralising local, state, and federal agencies in terms of capabilities, resources, and infrastructure. In policymaking circles, there is not a unified conceptual and analytical framework that recognises—from a multidimensional perspective—public safety, justice, and the rule of law as interdependent elements within a larger political system. On the contrary, there is a lack of consensus within relevant literature regarding specialised approaches vis-à-vis constitutional public safety and justice frameworks (UNAM 2011). Despite agreement within both national legislative and international discourses, there remains a dissonance between public safety policy—in both design and operation—and a constitutional human rights framework. As such, this contributes to a conceptual confusion in which the need for domestic security is inflated in order to provide the state with a maximum scope for intervention that ultimately weakens public accountability. This affirms existing beliefs that FAM leadership in public security tasks is not only important, but also necessary in light of the questionable integrity of municipal and state police agencies, postponing local institutional reform in favour of centralisation. This preventive approach remains disjointed in its implementation and is primarily seen as a method to acquire resources without monitoring or evaluation. Additionally, a politicised operational management has hindered progress by ignoring the need for wider coordination. All this has been exacerbated by a justice system that remains inefficient, opaque, and focused on a punitive rather than reform agenda as well as an overflowing prison system that more often results in recidivism than rehabilitation. Progress in the areas of public security, justice, human rights, and the prison system has vacillated between reforms and counter-reforms. The SNSP has functioned more as a forum for the struggle over federal resources rather than as a catalyst for learning, proposals, and consensus. An atmosphere of suspicion and competition has hindered cooperation and information exchange amongst public security and justice institutions. The desire for immediate political dividends has subverted efforts at medium and long-term restructuring. This has resulted in fragmented policies that do not utilise empirical and systematic information, institutional learning, or monitoring and evaluation processes. Overloaded, bureaucratic mechanisms and programs for the distribution and management of resources that encourage corrupt practices and result in little real impact or effectiveness. A lack of necessary skills for the dissemination, analysis, and management of information for use in preventative intelligence and containment strategies. An absence of consistent, long-term training and education programs, complemented by a weak public service career infrastructure, that results in minimal progress. Insufficient efforts, at the institutional level, to monitor, evaluate, and punish deviations or the misuse of resources. Thus, we see that the existing institutional, operational, and governmental consensus has resulted in a short-sighted vision for the public security agenda. This current, securitising discourse has politicised reform and excluded the civilian actors capable of affecting the institutional changes and securing the resources necessary to satisfy public safety demands. Therefore, ‘gatopardism’ is reflected by the fluctuation between reforms and counter-reforms, the prioritisation of institutional over state interests as well as the absence of evaluation mechanisms or overall public accountability. What is left then to promote when the processes of reform and institutional strengthening in the areas of public safety and justice—key indicators of democratic progress—are characterised by regression or stagnation? What role does public accountability and oversight play within a milieu of political, cultural, institutional, and bureaucratic interests beset by weak conceptual, operational, and interagency frameworks as well as wasted resources? In order to adhere to the democratic model, law enforcement must allow for the participation of civil society in the construction and development of its agenda. As discussed above, citizens—as external actors who are both concerned and affected by the issues of public safety and justice—have been excluded from policymaking. However, they remain necessary to the establishment of a decentralised, cooperative public security policy as well as broader efforts to redress violence and crime in Mexico. Accountability and transparency take on broader meanings given the institutional reality of public security and justice in Mexico. In this context, they refer not only to the ‘taking of responsibility’ but also to the subordination of public servants to the citizens who have conferred authority upon them. However, the concept behind these terms goes beyond any consequential measures for individual or institutional misconduct. As explained by Robert O. Varenik, the concept of accountability ‘transcends incorrect and limited notions related to the discipline of internal misconduct and instead refers to the development of mechanisms through which the police become a learning institution that both achieves results and earns public respect and confidence’ (Varenik 2005: 30). More broadly, ‘[a]ccountability is the mechanism—or rather the operating principle behind a series of mechanisms—to encourage discretion as well as limit poor performance and misconduct’ (Varenik 2005: 25—26). Recent literature has discussed police accountability in reference to a system of institutional management complete with internal and external control mechanisms. This principle holds greater relevance if one considers that police institutions not only possess the power to exercise the use of force but an obligation to do so responsibly. This is relevant especially in the case of transitional democracies like Mexico, where there is a struggle between old, authoritarian, and opaque policies and modern democratic programs in regard to institutional operation. Thus, within this broader conception of accountability, it is necessary to both promote discussion and lay the groundwork for monitoring and external oversight. The inclusion of civilian mechanisms, from the standpoint of structural and institutional reform, will contribute to the constructive evaluation of results, processes, and work systems. They are not intended to replace or devalue what has been accomplished thus far within relevant institutions. On the contrary, they will further the progress of various internal reform processes and strengthen overall institutional integrity. In Mexico, civilian oversight and external monitoring are still at a rudimentary stage. This is due to a resistance towards transparency and accountability that persists within state institutions as well as a citizenry that is both poorly informed and uninterested in public affairs. In response, politically active civilians have formed academic and activist groups to advance transparency, accountability, institutional strengthening, and human rights. This has been a growing trend particularly within large and complex urban territorial spaces. Thus, specific regions of the country that have experienced strong cycles of violence—such as Ciudad Juárez (Chihuahua), Tijuana (Baja California), Nogales (Sonora) as well as the states of Michoacán, Guerrero, and Tamaulipas—have seen the emergence of civilian stakeholders interested in monitoring and reforming public security institutions. It should be noted that the external oversight of public decentralised agencies (i.e. human rights commissions)7 should be distinguished from the external oversight of purely civilian actors as distinct typologies (as opposed to models). The Institute for Security and Democracy (Insyde) A.C. is an autonomous and trans-disciplinary organisation with eleven years of experience in Mexico. Among its main strategic objectives are: the research and construction of viable public security models; institutional strengthening and accountability; and the bolstering of civilian influence in public security and justice policies. As it relates to this agenda, Insyde has made progress in the areas outlined below. Insyde continues to promote civilian auditing mechanisms. Through a strategic line of action identified as ‘processes of institutional transition towards institutional public security frameworks’, Insyde has proposed the establishment of social observatories to monitor crime rate information and contribute to strategic decision-making in regard to policing and prevention policies. It has also supported public certification and oversight by introducing standards, procedures, protocols, and processes vis-à-vis police institutions. It is necessary to mention that throughout its experience, Insyde has faced political, institutional, and even social inertia—including short-term visions, elections and other governmental turnover that has truncated programs, politicised agendas, a trend towards centralisation, institutional cultures resistant to innovation, etc.—that have, in many instances, prevented the complete implementation of reform mechanisms. The following section outlines a few of the specific initiatives mounted by Insyde. In Mexico, the enormous institutional weakness present within all levels of government has been clearly evidenced by—among other factors—an inability to produce quality information to measure, evaluate, and implement policies in regard to violence and crime. Within this alarming milieu, observatories should emerge as monitoring mechanisms to pressure government institutions to both correct and improve these processes. Therein lies both their relevance and greatest contribution: observatories have the potential to positively impact democratic governance and—through the inclusion of external actors, views, and voices—provide greater legitimacy to policymaking. Unfortunately, the vast majority of political authorities still perceive observatories as inquisitorial or unpractical rather than as an effective tool for reform. Insyde, in partnership with the Cisalva Institute of Colombia—a champion of Latin American observatories since the 1990s—has developed a number of theoretical and methodological tools relevant for policymaking. These efforts have included the creation of outlets for consultation, knowledge exchange, and publication. Furthermore, Insyde has directly supported the establishment of state observatories in Colima, Oaxaca, Querétaro, Sonora, and Zacatecas. However, this process has been more about learning than results. Until this moment it has not been possible to consolidate these operations. The challenges and obstacles that Insyde has faced throughout this process have been numerous and diverse including a lack of an adequate vision amongst authorities; technical proficiency; institutional leadership; confidence in the advantages of interagency cooperation; and the effect of shifting political circumstances on sustaining projects that require long-term support. The main hurdle has been the prioritisation of political interests over technical expertise and strategic goals. Despite this ‘false’ dilemma of autonomy versus influence, the reality of the situation is that there is no consensus regarding the function of observatories or the standards they should seek to implement.10 In some cases, the proposals are limited (e.g. a restriction on government contributions) whilst others are more ambitious (e.g. policies relating to the intelligence gathering, prevention, and decision-making processes). These differing conceptions have generated considerable flexibility in terms of function as well as general confusion in terms of purpose (i.e. what an observatory is or is not vis-à-vis government information systems). Moreover, an explosion of available funds from federal institutions has fostered a kind of ‘observatory-itis’ that lacks an accompanying, comprehensive policy developed by business owners, civilians, and other stakeholders. There has been no serious attempt to bring together policymakers at different levels or define a course of action. For example, the relevant Allowance for Municipal Security (SUBSEMUN) guidelines have been strongly criticised as being inefficient and ineffective.11 These deficiencies are so extensive that observatories have been removed from the program’s catalogue of projects as of 2014. Tragically, the federal government has demonstrated it possesses neither the capabilities nor the interest to financially or administratively support observatories. Within government offices, no effort has been made to direct, track, or even document the current situation on a national basis. Insyde has partnered with the Inter-American Development Bank (IDB) to compile an index of public safety observatories in Mexico. This undertaking was part of a larger initiative—which included 17 participant countries across Latin America and the Caribbean—prompted by concern over government inaction and recognition of the progress made in countries such as Colombia. It represents the first steps towards constructing an overview of relevant conditions in Mexico. Although 72 observatories were identified within Mexico, only 22—equivalent to 30.5 per cent—were able to provide information for analysis (description, classification, geo-reference, etc.). This suggests that although the number of monitoring organisations may be growing, only few are able to report results. 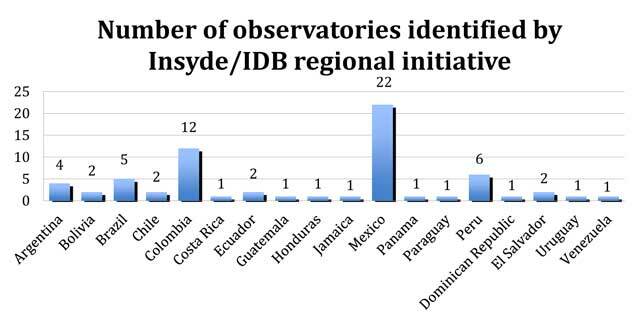 However, as shown in the Figure 1, Mexico has established the largest number of observatories followed by Colombia (12), Peru (6), Brazil (5), and Argentina (4). Therefore, of the 66 institutions analysed, a third are Mexican. This demonstrates not only institutional growth but also suggests a potential for these mechanisms to positively impact public policy if they are properly enhanced. Source: Inter-American Development Bank, preliminary data, regional mapping of security and violence observatories. The 22 participating observatories are distributed across 18 states. More than half the country (56 per cent of total number of states) has at least one functioning observatory. However, strategic planning and institutional strengthening are not considered a priority by most observatories: only eight (36 per cent) reported having engaged in such development and only seven (32 per cent) have conducted institutional assessments. Overall environmental impact: six (27 per cent) reported participating in public policy; three (13.5 per cent) in decision making; five (23 per cent) in information distribution; one (4.5 per cent) in monitoring; and seven (32 per cent) did not report any achievements. The most important, and distressing, finding is that only 40 per cent of observatories reported having any real impact. This should be further examined in order to ascertain their actual level of influence. Ultimately there exists little comprehensive knowledge or understanding about the impact of these organisations. Whilst substantial progress has been achieved by certain groups—such as the Centre for Social and Gender Violence Benito Juárez (Quintana Roo), the Municipality of Juárez Observatory for Public Safety and Coexistence (Chihuahua), and the National Citizen Observatory—there has been minimal effort to systematically document and analyse concepts, proposals, best practices, innovations, challenges, lessons learned, and other elements that have contributed to the success of failure of public safety observatories. Therefore, areas of improvement involve establishment and standardisation; the strengthening of methodological processes (particularly in terms of consolidation and sustainability); maximizing influence in policymaking at the local level; and the creation of professional networks amongst interested individuals and institutions. In addition, the political awareness of various stakeholders must be matched by a professionalised agenda and infrastructure. On 25 March, 2014, the Municipal Council of Querétaro unanimously approved the creation of the Police Auditing Directorate (DAP). This agency represents the first external oversight mechanism with direct authority over a Mexican police force. To some extent, its institution represents the culmination of nearly a decade of reform promoted by Insyde. The establishment of the DAP was part-and-parcel of broader efforts to restructure and modernize the strategic, political, and institutional culture of the Municipal Ministry of Public Security. The success of this venture was predicated in large part upon the existence of a reformist agenda within the office of the municipal president including openness to innovation and willingness to accept the consequences of institutional restructuring. The Municipality of Querétaro boasts one of the best public safety records in the entire country. This has been complemented by the Municipal Ministry of Public Security, which has demonstrated a commitment to modernisation including the establishment of a code of conduct as well as oversight bodies such as the Operational Control Department of the Municipal Guard, Internal Inspectorate, and the Council of Honour and Justice. These factors alleviated social pressures and allowed police forces to more effectively allocate resources and adopt practices that improved overall institutional performance. It is also important to recognise improvements made by key players in the areas of individual and institutional cooperation. Interaction between external stakeholders and police forces has been constant and included physical meetings, document exchange, and feedback. A growing recognition of key concepts and the study of successful experiences have helped to resolve issues and ameliorate concerns. The involvement of the municipal president has facilitated cooperation by mediating disputes and articulating the expectations and preferences of the municipal government. A broader regional study identified the Superior Municipal Audit Control (ASFM) as the best mechanism for the integration of police oversight functions.15 The DAP falls under the direct purview of the ASFM. The latter is appointed by an absolute majority of the Municipal Council and serves for four years, with an option for an additional term upon ratification.16 In Mexico, where municipal governments serve three years, this staggered electoral process not only ensures continuity but also greater autonomy from the executive by separating command, financial, and political structures. Evaluating the performance and operation of the Municipal Public Security Secretariat by receiving and processing complaints; issuing recommendations and conducting internal investigations; and developing proposals for police compliance and improvement. Documenting cases within its jurisdiction at the request of relevant disciplinary bodies. Requesting legal information as it relates to institutional personnel. Conducting inspections of offices and investigating activities affiliated with the Ministry of Municipal Security. Proposing standards, procedures, or protocols to improve the operations of the Secretariat. Facilitating public transparency and forging links with the communities within its jurisdiction. The processes with which it was decided to commence the DAP route of action consisted of three external or police-community interaction processes (breathalyser program, traffic violations and response to emergency calls) and two institutional strengthening processes (promotion and advancement program, and registration, capture and use of information process for the Official Police Report). Additionally, the following protocols are in the process of being formalised for the operation of the Police Audit itself: receipt and processing of complaints; validation studies (dependent on the Internal Inspectorate); case documentation; visits or inspections; and information and transparency activities. At the time of this writing, this pilot program has been in operation for three months and has already produced important lessons for the further implementation of reform at the municipal level. Although the full value of this initiative may not be evident until its conclusion, there exists a potential for immediate, positive impact. Insyde is convinced that the DAP and similar programs can provide inestimable support to the cause of democratic reform in a manner than reconciles the needs of law enforcement with those of civil society. In recent years, Insyde has made efforts to introduce similar oversight mechanisms at both the state and national level, including an Independent Federal Police Auditor (a proposal rejected by the Senate of the Republic in 2011). Special reference should be made to the partnership between Insyde and other civilian allies in the La Montaña region (Guerrero)—specifically the La Montaña ‘Tlachinollan’ Centre for Human Rights and the Fundar Centre for Analysis and Research—between 2007 and 2013. The partnership, known as the Civil Monitor of the La Montaña Police and Public Security Forces (MOCIPOL), provided four key services: support for citizens who report human rights violations committed by the police; support for policemen who received abuses from their municipal police institutions; the development of proposals for local institutional reform; and the mediation of conflict involving municipal police forces. The development and implementation of a civilian oversight agenda was extremely ambitious, especially in La Montaña, an area with a longstanding authoritarian tradition, strong inequalities, acute material poverty, and social vulnerability. Progress in the four functions listed above was mixed with the most impact being made in the area of citizen support. In addition to this problematic context, there were two other factors that frustrated overall MOCIPOL efforts to emerge as an autonomous and impactful organisation in the region: a breakdown of local governance that led to the creation of ‘self-defence groups’17; and an inability of Insyde, ‘Tlachinollan,’ and Fundar to agree on the fundamentals of civilian police oversight. A re-evaluation of traditional perspectives within the framework of human rights related to the complexity that involves police misconducts is needed. Law enforcement agents should be not viewed as perpetrators singularly responsible for their actions but rather as individuals subject to a disorderly, uncontrolled, and authoritarian institution. MOCIPOL was a driving force in the systematisation and management of information regarding human rights violations committed by law enforcement institutions in La Montaña. This is not only an informative heritage about police practices and misconducts, but also on the expression of critical junctures and deepening of the institutional crisis and violence in the region (MOCIPOL 2011; 2014). MOCIPOL served as a space for development at the ground-level and has allowed for a greater exchange of knowledge, the creation of new tools, and the identification of challenges facing allied organisations. Regardless of any disagreement amongst the various constituent organisations of MOCIPOL, it should be recognised that the initiative attempted to implement—and in some respects, achieved—reform within the La Montaña region that can serve as a broader example throughout Mexico. In the past, Insyde has encountered a variety of political interests and institutional inertia that have made the establishment of a comprehensive civilian oversight agenda unfeasible. Nevertheless, these efforts have aided the learning process, particularly in regard to relevance, sustainability, adaptability, and replication. Moreover, growing external political and institutional support has contributed to some promising advances. Local conditions determine both the potential and limitation of programs. Insyde has engaged in an extensive comparative study of successful measures implemented in Mexico and other parts of the world. There is—of course—a great variety of experience and approaches to the subject of police reform and civilian oversight. However, we have concluded that the concepts and principles are the elements that actually build promising experiences and that models should be designed upon the existing needs and resources of the locality in question and therefore be developed on a case-by-case basis. A clear consensus is needed in order to promote a collaborative civilian oversight agenda. This requires an identification of the character and scope of strategic partnerships. Furthermore, it also necessitates recognition of the intrinsic differences that exist between organisations, their various internal frameworks, and policy approaches; this will facilitate institutional transparency and cooperation. Law enforcement and other criminal justice bodies must be viewed as both ‘institutions’ in a legal and political sense as well as organisations from a psychosocial perspective (Tudela 2010). This distinction is highly relevant considering that in the social sciences, culture is a key factor in understanding institutions and organisations. This recognition is even more relevant when one considers that police cultures or subcultures—referred to as true ‘cultural islands’ by Patricio Tudela—largely determine the level of commitment to collaborative public safety strategies, community outreach, and the acceptance or rejection of performance review mechanisms. The lesson here is very simple: any initiative that seeks to alter formal or informal practices of the police should acquire their support and participation. Public security apparatuses bear the primary responsibility for the integrity and proper behaviour of their agents. It must be stressed that the existence of external oversight mechanisms cannot replace police self-regulation and monitoring, but rather complement and strengthen their accountability. Law enforcement leadership must be convinced that these mechanisms will not mount ‘witch hunts’ but instead serve as tools for the support and improvement of their organisations. From this perspective, raising awareness among internal and external stakeholders is necessary to standardise visions and expectations for the implementation and outcomes of reform efforts. To meet this challenge, it is necessary that initiatives be anchored within local legislation. This will of course require an identification of relevant legal frameworks as well as the policies of those institutions possessing supervisory authority. Moreover, gradual advancement in cooperation with competent authorities and the establishment of a viable personnel infrastructure are necessary preconditions for success. Among the principles that we believe are essential for the proper operation of an external oversight mechanism are: autonomy (i.e. freedom to manage its own agenda without pressure or restrictions of any kind); open-access (i.e. the ability to access information without restriction and in-keeping with its authorised responsibilities); authority (i.e. the ability to submit and enforce recommendations); and accountability (i.e. a requirement to issue reports and otherwise inform the public of developments and overall outcomes). A detailed strategic plan outlining short, medium, and long-term goals (and the methods necessary to achieve them) is essential. Current outcomes have shown that development of comprehensive operating protocols is necessary to provide guidance in the event of various scenarios, limit discretionary action, and formalise the process by which policies are instituted. Furthermore, given the large volume of information processed by civilian oversight bodies, an information management system (including prevention and monitoring functions) that allows for the identification of patterns, trends, and institutional inadequacies should be adopted. 1Mexican police forces are organised into three jurisdictions (municipal, state, and federal) and serve three main functions (response, prevention, and investigation). According to the Executive Secretariat of the National System of Public Security, there were 420,349 active agents within various police forces as of October 2012. See Diario El Universal (2013). 2This figure was produced by the National System of Public Security. In November 2013, a provisional list of persons reported missing between 2006 and 2012—compiled by the Office of the Attorney General and the Interior Ministry—was leaked to the media. See CNDH (2007—2013). 3All organisational acronyms utilise original, Spanish-language designations. 4The strength of municipal police forces has been estimated at over 400,000 in comparison to 35,000 federal agents. 5According to data produced by the 2013 National Survey on Victimisation and Perception of Public Security—conducted by the National Institute of Statistics and Geography (INEGI)—92.1 per cent of crime went unreported or without investigation in 2012. Furthermore, 61.9 per cent of respondents cited a sense of futility or distrust in government authority as factors in their decision not to report criminal activities. See INEGI (2013). 6In a survey of 950 law enforcement agents serving in 19 states, more than half of respondents considered feedback to be of little value; four out of five stated they were never informed of any overall decisions. See Causa en Común (2013). 7As public organisations they are normally capable of affecting only limited institutional reform. 8Observatories have been conceived, more broadly, as specialised and multidisciplinary centres that monitor social phenomenon, analyse information, and propose policies in the interest of the public. 9This is largely attributable to two major breakthroughs. Firstly, the institution of ANSJL in 2008, which included among its clauses ‘the creation of a Citizen Observatory…representing the various sectors of society, including experts recognised for their leadership in the areas of public security and justice.’ Additionally, since 2011, observatories have been eligible to participate in the Allowance for Municipal Security, which gives access to the resources of more than 200 municipalities (268 as of 2014) afflicted by high rates of crime. 10Some argue that observatories must be fully autonomous in order to avoid any conflict of interest, whilst others contend that government affiliation would provide greater influence over the development and implementation of policy. In the end, both models have proven benefits dependent upon certain local realities. This energy should instead be focused upon other more important issues such as evaluation criteria and indicators. 11Among other issues, criticism has been levelled at the program’s attempt to introduce a single model and methodology across all participating municipalities without consideration of local needs or resources. As a consequence, both programmatic growth and sustainability have been subverted. 12The variety of current methodologies and strategies must also be taken into account. 13Participating observatories were able to indicate multiple areas of influence. 14Relevant areas include: public security and crime; social-related violence; economic-related violence; epidemiology; criminology; coexistence and civic culture; violence surveillance systems; programs and intervention activities; and legal care, advocacy, and assistance. 15The ASFM is a decentralised and autonomous government agency that manages personnel, programs, and financial resources via the Municipal System of Prevention, Supervision, Control, Monitoring, and Evaluation. 16On 23 May 2014, Dr Rosa Maria Ojeda was appointed Chief of the Police Auditing Directorate. Dr Ojeda has a distinguished career in academia and held posts in the State Judiciary, State Supreme Court, Deputy Secretary of the Interior, State Council of Public Security, and the Municipal Ministry of Public Security. Furthermore, the Municipal Council established minimum requirements for this position including: three years of local residency; a Bachelor’s degree in a relevant field; and three years of experience and/or a basic knowledge of: human rights, justice, appropriate use of force, and firearms. 18Particularly in terms of setting guidelines regarding police brutality as well as mediation between police and local communities. Causa en Común (2013). ‘¿Qué Piensa la Policía?’ Resultados del Cuestionario a Policías 2013. Available at http://www.causaencomun.org.mx/oldweb/admin/abc/archivos/Resultados%20Cuestionario%20a%20Policia_2013_VI.pdf [Last accessed 5 November 2014]. Comisión Nacional de derechos Humanos (CNDH) (2007—2013). ‘Informes de Actividades’ (varios volúmenes). Available at http://www.cndh.org.mx/Informes_Actividades [Last accessed 5 November 2014]. Diario El Universal (2013). ‘SNSP establece un año para certificar a policías en el país,’. January 10 2013 Available at http://www.eluniversal.com.mx/notas/894924.html [Last accessed 5 November 2014]. Diario El Universal (2014). ‘EPN pondrá en operación la Gendarmería Nacional mañana’. August 21 2014 Available at http://www.eluniversal.com.mx/nacion-mexico/2014/epn-gendarmeria-nacional-operacion-1032201.html [Last accessed 5 November 2014]. Diario Oficial de la Federación (2008). ‘Acuerdo Nacional por la Seguridad, la Justicia y la Legalidad’. August 25 2008 Available at http://www.dof.gob.mx/nota_detalle.php?codigo=5057719&fecha=25/08/2008 [Last accessed 5 November 2014]. Instituto Nacional de Geografía, Estadística e Informática (INEGI) (2013). ‘Encuesta Nacional sobre Victimización y Percepción de la Inseguridad’, Available at http://www.inegi.org.mx/est/contenidos/proyectos/encuestas/hogares/regulares/envipe/default.aspx [Last accessed 5 November 2014]. Instituto para la Seguridad y la Democracia (INSYDE) Dirección de Investigación Aplicada (2014). ‘Una aproximación a los costos de la violencia y la inseguridad en México’. March 2014 Available at http://insyde.org.mx/una-aproximacion-los-costos-de-la-violencia-y-la-inseguridad-en-mexico/ [Last accessed 5 November 2014]. López Portillo, E (2014). ‘Gendarmería, otra vez, más policía’. August 19 2014 Available at http://www.eluniversalmas.com.mx/editoriales/2014/08/71930.php [Last accessed 5 November 2014]. México Evalúa (2011). ‘El gasto en seguridad: observaciones de la Auditoría Superior de la Federación a la gestión y uso de recursos’. June 28 2011 Available at http://masciudadania.org/mexicoevalua/MEX_EVA-INHOUS-GASTO_SEG-LOW.pdf [Last accessed 5 November 2014]. Moloeznik, M P and Suárez de Garay, M E (2012). ‘El proceso de militarización de la seguridad pública en México 2006—2010.’. Frontera Norte 1(48): 121–144. Available at http://www.colef.mx/fronteranorte/articulos/FN48/5-f48.pdf. Monitor Civil de la Policía y de las Cuerpos de Seguridad de La Montaña de Guerrero (MOCIPOL) (2011). ‘Desde la mirada ciudadana. Informe del Monitor Civil de la Policía y de las Cuerpos de Seguridad de La Montaña de Guerrero.’. Available at http://fundar.org.mx/desde-la-mirada-ciudadana/#.VFrJG_50zIU [Last accessed 5 November 2014]. Monitor Civil de la Policía y de las Cuerpos de Seguridad de La Montaña de Guerrero (MOCIPOL) (2014). ‘Alcozauca. Ser policía en la Montaña de Guerrero’. Available at http://insyde.org.mx/alcozauca-ser-policia-municipal-en-la-montana-de-guerrero/ [Last accessed 5 November 2014]. Presidencia de la República (2014). Diversas intervenciones durante la 36 Sesión del Consejo Nacional de Seguridad Pública. August 22 2014 Available at http://www.presidencia.gob.mx/articulos-prensa/diversas-intervenciones-durante-la-36-sesion-del-consejo-nacional-de-seguridad-publica/ [Last accessed 5 November 2014]. Tomasi di Lampedusa, G (1958). El Gatopardo In: Editorial Argos: Vergara, Barcelona. 20 Available at http://www.ignaciodarnaude.com/textos_diversos/Lampedusa,El%20Gatopardo.pdf. Tudela Poblete, P (2010). ‘Cultura Policial y Control Interno.’. Revista Estudios Policiales (7): 75–107. Available at http://www.asepol.cl/spa/areaExtension/internas/pdf/numero_7/07tudela.pdf [Last accessed 5 November 2014]. Universidad Nacional Autónoma de México Instituto (UNAM) (2011). Iberoamericano de Derechos Constitucional 2011. ‘Conferencia Internacional sobre seguridad y justicia en democracia. Hacia una política de Estado en los albores del Tercer Milenio. Elementos para la construcción de una política de Estado para la seguridad y la justicia en Democracia’. August, Available at http://www.abogadogeneral.unam.mx/PDFS/Propuesta_Seguridad_y_Justicia_en_Democracia.pdf [Last accessed 5 November 2014]. Varenick, R O (2005). ‘Accountability: sistema policial de rendición de cuentas’ In: Mexico City: Instituto para la Seguridad y la Democracia.